Our job placement services follow a standardized process, and is designed to provide the best possible outcome for job applicants. We aim to build a relationship based on mutual respect and trust, and we strengthen it with constant communication and correspondence. We put great importance in our interactions with a candidate, and provide meaningful advise and suggestions in preparing them for a job position. The first step is to register yourself through our website. Once registration is complete, you may proceed to create or upload and edit your resume. Our entry forms provide ample opportunity for you to highlight your skills, experience and aspirations. To get the most out of this process, please be sure to provide only accurate and factual information. Once a resume has been uploaded or updated, our recruitment counselors begin to match them against any current staffing requirements, from our corporate partners. Candidates are advised to constantly their resumes, to reflect the most recent capabilities and experience. Once a pool of potential candidates have been selected, we approach them for the first time. We invite potential candidates for a preliminary interview at our office. Our goal is to provide consultation regarding job position(s) we consider suitable for the candidate, and also to know the candidate personally. We also learn about the candidate’s career related hopes and aspirations, which help us to understand their priorities regarding their search. Once a pool of candidates matching the job requirements have been screened (according to job, personality and organizational match), we send their resumes to potential employers for review. We work closely with the HR departments of each employer to guide them towards a mutual solution. Based on the reviews of potential employers, we invite selected candidates for one or several rounds of corporate level interviews. We receive detailed feedback from each company, that allows us to choose the right personnel. 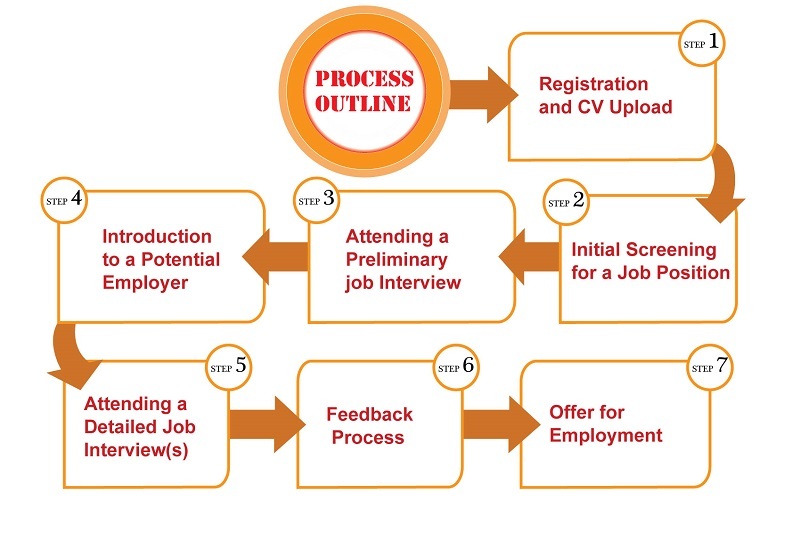 Based on the feedback process of potential employers, we contact all applicants to inform them on the final decisions. For unsuccessful candidates, we seek alternative employments with the greatest chance of success. Once a company decides to make an offer of employment to a candidate, we take care of all the necessary paperwork and legal issues pertaining to the case. The candidate is formally informed about the decision, and is groomed for the official handover process. Each and every case is differ from one another, in may regards. We always work to achieve complete satisfaction and recognition from both the candidate and our corporate partners.